Arizona Cardinals vs. Los Angeles Rams Tickets - 12/1/2019 - State Farm Stadium in Glendale at Stub.com! Does not include admission to event. Tickets will be ready for delivery by Nov 30, 2019. Parking Pass Only. Does not include admission to event. Does not include admission to event. Tickets will be ready for delivery by Jul 29, 2020. Mobile Entry Tickets. Must have smart device on hand to enter event. Do not print these tickets. Tickets will be ready for delivery by Nov 29, 2019. Mobile Entry Tickets. Must have smart device on hand to enter event. Do not print these tickets. Tickets will be ready for delivery by Dec 01, 2019. Mobile Entry Tickets. Must have smart device on hand to enter event. Do not print these tickets. Limited view seating. Tickets will be ready for delivery by Nov 29, 2019. Mobile Entry Tickets. Must have smart device on hand to enter event. Do not print these tickets. Tickets will be ready for delivery by Nov 28, 2019. End zone seats. Xfer Mobile Entry. Scan your tickets from your mobile phone for this event. Do not print these tickets Tickets will be ready for delivery by Nov 27, 2019. Mobile Entry Tickets. Must have smart device on hand to enter event. Tickets will be ready for delivery by Nov 27, 2019. Mobile Entry Tickets. Must have smart device on hand to enter event. Do not print these tickets. Tickets will be ready for delivery by Nov 30, 2019. Corner end zone seats. Xfer Mobile Entry. Scan your tickets from your mobile phone for this event. Do not print these tickets Tickets will be ready for delivery by Nov 27, 2019. Mobile Entry Tickets. Must have smart device on hand to enter event. Do not print these tickets. Tickets will be ready for delivery by Nov 01, 2019. Mobile Entry Tickets. Must have smart device on hand to enter event. Do not print these tickets. Tickets will be ready for delivery by Nov 24, 2019. Mobile Entry Tickets. Must have smart device on hand to enter event. Do not print these tickets. Tickets will be ready for delivery by Nov 27, 2019. Mobile Entry Tickets. Must have smart device on hand to enter event. Tickets will be ready for delivery by Nov 29, 2019. Sideline seats between the 10 and 20 yard lines. Visiting teams side. XFER Mobile Entry. Scan your tickets from your mobile phone for this event. Do not print these tickets. Tickets will be ready for delivery by Nov 27, 2019. Mobile Entry Tickets. Must have smart device on hand to enter event. Do not print these tickets. Does not include admission to event. Alcohol free section. Tickets will be ready for delivery by Nov 29, 2019. Xfer Mobile Entry. Scan your tickets from your mobile phone for this event. Do not print these tickets Tickets will be ready for delivery by Nov 27, 2019. Third row in this section. Tickets will be ready for delivery by Nov 21, 2019. Sideline seats between the end line and the goal line. Visiting teams side. XFER Mobile Entry. Scan your tickets from your mobile phone for this event. Do not print these tickets. Tickets will be ready for delivery by Nov 27, 2019. Second row in this section. Tickets will be ready for delivery by Nov 21, 2019. Mobile Entry Tickets. Must have smart device on hand to enter event. Do not print these tickets. Tickets will be ready for delivery by Nov 26, 2019. Mobile Entry Tickets. Must have smart device on hand to enter event. Do not print these tickets. Tickets will be ready for delivery by Jul 29, 2020. Mobile Entry Tickets. Must have smart device on hand to enter event. Do not print these tickets. No alcohol. Tickets will be ready for delivery by Nov 30, 2019. Sideline seats between the goal line and the 10 yard line. Visiting teams side. XFER Mobile Entry. Scan your tickets from your mobile phone for this event. Do not print these tickets. Tickets will be ready for delivery by Nov 27, 2019. Alcohol Free Section. Tickets will be ready for delivery by Nov 29, 2019. Alcohol is not permitted in these seats. Tickets will be ready for delivery by Sep 06, 2019. 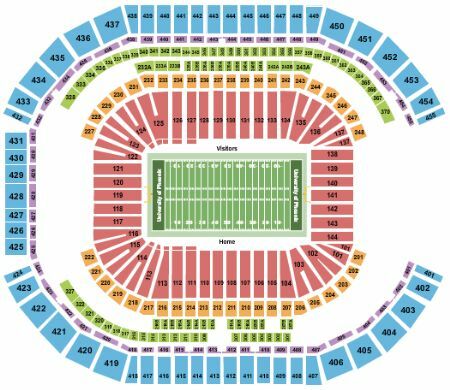 These seats are located in the designated Family Section. Alcohol is not permitted in the Family Section. Tickets will be ready for delivery by Nov 21, 2019. These seats are located in the designated Family Section. Alcohol is not permitted in the Family Section. Tickets will be ready for delivery by Nov 27, 2019. MobileQR Entry. Scan your tickets from your mobile phone for this event. Do not print these tickets. Tickets will be ready for delivery by Nov 30, 2019. Second row. Sideline seats between the end line and the goal line. Tickets will be ready for delivery by Nov 27, 2019. Home teams side. Sideline seats between the 10 and 20 yard lines. XFER Mobile Entry. Scan your tickets from your mobile phone for this event. Do not print these tickets. Tickets will be ready for delivery by Nov 27, 2019. Second row. Sideline seats between the 10 and 20 yard lines. Tickets will be ready for delivery by Nov 27, 2019. Standard Hotel Package includes 2 nights at a 4-Star hotel near the venue (check-in day before game, check-out day after game) | Upper Level end zone or corner game ticket in sections 419 thru 437 or 450 thru 406 (orders of three or more may be split) | Admission to the Game Zone starting 3 hours prior to kickoff featuring all-inclusive BBQ menu and non-alcoholic beverages, 2 drink tickets (beer or wine - additional alcoholic drinks available for purchase), pregame radio broadcasts, Cardinals Pregame Huddle, TVs featuring early NFL games, Cardinals Cheerleader appearances, interactive games and more | Gift bundle (1 per person) | Ticket upgrades - additional hotel nights or specific days may be obtainable upon request | Rate is based on double occupancy | Orders for a quantity of one are subject to an additional charge |. Deluxe Hotel Package includes 2 nights at a 4-Star hotel near the venue (check-in day before game, check-out day after game) | Roundtrip airport transfers | Lower Level end zone or corner game ticket in sections 113 thru 125 or 134 thru 104 (orders of three or more may be split) | Admission to the Game Zone starting 3 hours prior to kickoff featuring all-inclusive BBQ menu and non-alcoholic beverages, 2 drink tickets (beer or wine - additional alcoholic drinks available for purchase), pregame radio broadcasts, Cardinals Pregame Huddle, TVs featuring early NFL games, Cardinals Cheerleader appearances, interactive games and more | Gift bundle (1 per person) | Ticket upgrades - additional hotel nights or specific days may be obtainable upon request | Rate is based on double occupancy | Orders for a quantity of one are subject to an additional charge |. Parking Pass Only. Does not include admission to event. Does not include admission to event. Tickets will be ready for delivery by Nov 29, 2019.